Citation: 2016 Martin TJ. This is an open-access article distributed under the terms of the Creative Commons Attribution License, which permits unrestricted use, distribution and reproduction in any medium, provided the original author and source are credited. Copyright: © Martin TJ. A Modified Approach to Maintenance Fluids of Hospitalized Pediatric Patients. J Clin Med Ther. 2016, 1: 1. There have been several articles regarding the development of hyponatremia using the Holliday and Segal formula for maintenance fluid therapy. This hyponatremia is caused by excessive antidiuretic hormone production. This article advocates a new formula for calculating maintenance fluids. There have been several articles written regarding the development of hyponatremia using the Holliday and Segal [1-20], formula for maintenance fluid therapy. Most of them have been observational studies. All authors agree that this hyponatremia is caused by excessive antidiuretic hormone production [2-5,12-15,17,19,21,22]. Excessive amounts of antidiuretic hormone can occur in many childhood medical conditions such as; the use of anesthesia agents, surgery, drugs (such as ecstasy, morphine, and chemotherapy drugs), asthma, bronchiolitis, chronic lung disease of prematurity, reduced atrial filling, quiet standing, gastroenteritis, meningitis, encephalitis, head injury, and going from a cool to warm environment . It has been suggested that maintenance therapy be given as normal saline, [2-4] but that causes problems with sodium overload . An infusion of normal saline solution in the presence of excessive ADH leads to hypertonic urine production with high urinary levels of sodium (>200 mg/L) which in turn can result in retention of free water and thus lowering the sodium farther [8-9]. Isotonic saline should be given only when there is a hemodynamic indication for that infusion -such as dehydration, burns, infections shock, or traumatic shock. Another factor in the production of hyponatremia is that some of the children that developed hyponatremia received significantly more fluids than recommended by Holliday and Segar . This was verified by Hoorn , Finberg , verified the solid scientific evidence underlying the Holliday and Segar  article. When the child is hospitalized, he/she will be less active than normal. Thus the patient fluid requirement will be closer to the basal metabolic rate than the total expenditure with normal activity of an afebrile child . All of the articles that suggest 0.9% saline as the maintenance fluid ignore the basic problem. This hyponatremia is due to excessive ADH. This is the first article that presents a method of preventing hyponatremia by treating the excessive ADH. Â of the calculated maintenance [1,10]. Since this hyponatremia is due to excessive ADH, leading to the retention of water, and since most hospitalized children will have a condition that may cause excessive ADH , it is my suggestion that maintenance fluids be given closer to the basal metabolic rate curve. This can best be done by giving 75 mL/kg for the first 10 kg, 40 mL/kg for the next 10 kg (10-20 kg), and 20 mL/kg for weight above 20 kg. Â  of the calculated fluid requirement. This should be given as 5 or 10% glucose, to decrease the breakdown of protein and fats, in ¼ normal saline and 20 mEq of potassium per litre (1000 mL). The IV fluids that are given for maintenance should be individualized as the situation requires. Normal saline solution should only be used to treat deficits or on-going losses as dehydration, burns, and infectious or traumatic shock. Electrolytes must be monitored daily. The above reasoning and approach will permit children who require IV fluids to receive such without receiving excessive sodium or becoming hyponatremic (Figure 1). 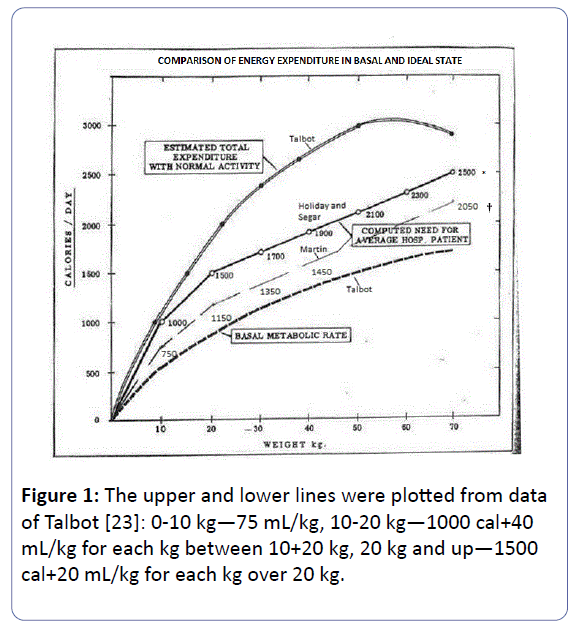 Figure 1: The upper and lower lines were plotted from data of Talbot : 0-10 kgÃ¢ÂÂ75 mL/kg, 10-20 kgÃ¢ÂÂ1000 cal+40 mL/kg for each kg between 10+20 kg, 20 kg and upÃ¢ÂÂ1500 cal+20 mL/kg for each kg over 20 kg. Holliday MA, Segar WE (1957)The maintenance needs for water in parenteral fluid therapy. Pediatric 19: 823-832. Moritz ML, Ayus JC (2004) Hospital-acquired hyponatremia: why are there still deaths? Pediatrics 113: 1395-1396. Hoorn EJ, Geary D, Robb M, Halperin ML, Bohn D (2004) Acute hyponatremia related to intravenous fluid administration in hospitalized children: an observational study.Pediatrics 113: 1279-1284. Wang J, Xu E, Xiao Y (2014) Isotonic versus hypotonic maintenance IV fluids in hospitalized children: a meta-analysis. Pediatrics133:105-113. Nielsen S, Chou CL, Marples D, Christensen EL, Kishore BK, et al. (1995) Vasopressin increases water permeability of kidney collecting duct by inducing translocation of aquaporin-CD water channels to plasma membrane.Proc Natl Acad Sci 92: 1013-1017. Holliday MA, Freidman AL, Segar WE, Chesny R, Finberg L (2005) Reply. J Pediatr274-275. Finberg L (2004) Hospital-acquired hyponatremia. Pediatrics 114: 1741. Shafiee MA, Bohn D, Hoorn EJ, Halperin ML (2003) How to select optimal maintenance intravenous fluid therapy. QJM 96: 601-610. Steel A, Gowrishanker M, Abrahmson S, Mazer D, Feldman R, et al. (1997) Postoperative hyponatremia despite isotonic saline infusion: A phenomenon of desalination. Ann Intern Med 126: 20-25. Holliday MA, Friedman AL, Segar WE, Chesney R, Finberg L (2004) Acute Hospital-Induced Hyponatremia in Children:A Physiologic Approach. J Pediatr 145: 584-587. Holliday MA( 2005)Isotonic saline expands extracellular fluid and is inappropriate for maintenance therapy.Pediatrics 115: 193-194. Alves JTL, Troster EJ, De Olivira CAC (2011) Isotonic saline solution as maintenance intravenous fluid therapy to prevent acquired hyponatremia in hospitalized children.J Pediatr 87: 478-486. Rey C, Los-ArgosM, Hernandez A, SanchezA, Diaz J, et al. (2011) Hypotonic versus isotonic maintenance fluids in critically ill children: a multicenter prospective randomized study.Acta Paediatr 100:1138-1143. Moritz ML, Ayus JC (2011) Intravenous fluid management for the acutely ill child.Curr Opin Pediatr 23: 186-193. Carandang F, Anglemyer A, Longhurst CA, Kishnan G, Alexander SR, et al. (2013) Association between maintenance fluid toxicity and hospital-acquired hyponatremia.J. Pediatr163: 1646-1651. Mc Nab S, Ware RS, Neville KA, Choong K, Coulthard MG, et al. (2014) Isotonic Verses hypotonic solutions for maintenance intravenous fluid administration in children.Cochrane Database Syst Rev 18: CD009457. Foster BA, Tom D, Hill V (2014) Hypotonic versus Isotonic fluids in hospitalized children:A systemic review and meta-analysis J. Pediatr 165: 163-169. McNab S (2015) Isotonic vs Hypotonic Intravenous fluids for hospitalized Children. JAMA 314: 720-721. 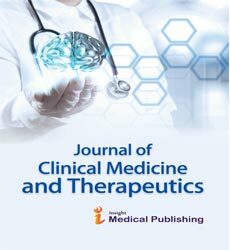 Padua AP, Macaraya JRG, Dans LF, Anacleto FE (2015) Istonic versus hypotonic saline solution for maintenance intravenous fluid therapy in children:A systematic review.Pediatr Nephrol 30: 1163-1172. McNab S (2016) Intravenous maintenance fluid therapy in children.J Paediatr Child Health 52: 137-140. Saba TG, Fairbairn J, Houghton F, Laforte D, Foster BJ (2011) A randomized controlled trail of isotonic versus hypotonic maintenance intravenous fluids in hospitalized children.Pediatrics11:82. Valadao MC, Piva JP, Santana JCB, Garcia PCR (2015) Comparison of two maintenance electrolyte solutions in children in the postoperative appendectomy period:a randomized, controlled trail.J Pediatr251: 1-7. Talbot FB (1949) Basal metabolism in children, in Brennemann’s Practice of Pediatrics.Hagerstown, Prior.